Your wedding day is the arguably the most special day in your life and the place where you get married can only accentuate this experience. With myriad options available across hotels, resorts and banquet halls, you are spoilt for choice. Here are some of our top picks. Amidst the exotic ranges of Himalayas, JW Marriott Mussoorie Walnut Grove Resort & Spa is a splendid location for an unforgettable wedding celebration. Couples can experience opulence embodied within the 4200 square feet of banquet space. With a variety of entertainment options, a majestic spread of delectable cuisines and outdoor venues offering a splendid view of the Gharwal range of Himalayas, this is an ideal place for a resplendent ceremony. Expansive indoor ballrooms, picture perfect outdoor venues, artistically crafted rooms and intricate décor options to add special touches ensure a fascinating wedding revelry transcending your expectations. The culinary team offers various menu options for the wedding and preceding functions. For cocktails and pre-wedding functions such as Haldi and Mehendi, the team can recommend numerous specialty set-ups, and bespoke setup for different meals at various locations. The Grand Orchard Ballroom at 3,300 sq. ft., includes three break-out rooms and a spacious pre-function area, Azalia Court, to perfectly curate experiences with flawless coordination and unique event design. JW Terrace, the walnut grove offers breathtaking view of the resort is perfect for your Pheras and Jaimala and The Magnolia Court is a colourful open-air space, perfect for pre-wedding functions like Mehendi and Haldi. The Trout House Grill & Bar, the specialty restaurant offers a scenic outdoor seating for theme parties and cocktails. The USP of this hotel is India’s largest pillar-less banquet hall in a luxury hotel (25,000 sq ft or 2268 sqm), located on the ground floor and capable of hosting up to 6,000 guests as floating crowd and 2500 guests in a theatre style setup. The beautiful outdoor venues add the much-needed charm to every function. A private concierge that coordinates with both sides of the family ensures that everybody is comfortable and each individual’s needs is looked after. The two towers of the hotel namely the Club Tower and the Hotel Tower have a pre-lobby, a main lobby and a fitness centre respectively, that is available to provide assistance to our guests at all points in time. Apart from accommodation and decoration, they have a dedicated team that generates a special and unique theme based menu for the guests which is custom-made to the taste of the family hosting the function. The ballrooms offer a perfect background to play around with different themes and colour schemes that are crucial for wedding decor. The ceiling lights of the ballrooms can also be set to theme by adjusting and changing their colours. Every aspect of the wedding venues can be tailor-made to fit the theme of the function perfectly. Not only do they have a large ballroom but also different break away rooms of varying sizes for small and large events. A quintessential private club spread across 400 acres, Oxford Golf Resort offers a range of hand-picked amenities to suit any event. 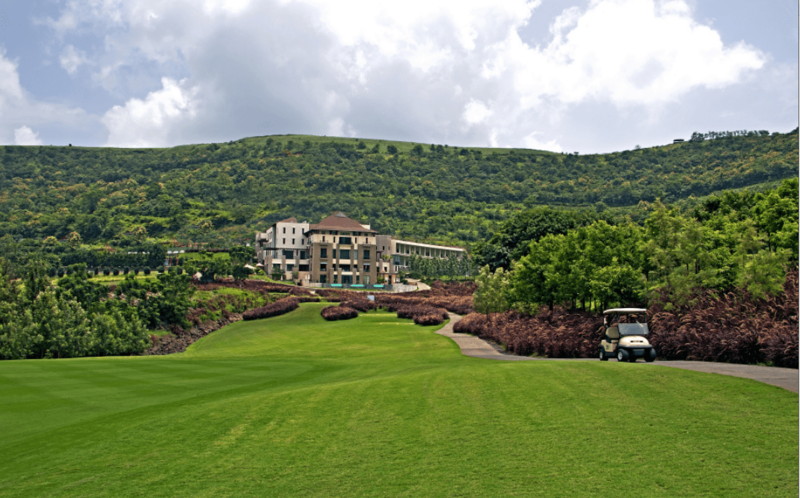 Its unique location on the Bombay – Pune highway coupled with a beautiful golf club backdrop makes it for a great destination for weddings. Couples can also plan their pre-wedding shoots at the property and select from 6 different venues at the property for their big day. Catered venues are available for Weddings, Sangeet parties and Mehendi functions by the pool. “We offer guests a selection of six different venues at Oxford Golf Resort and our spacious banquet halls and sophisticated board rooms are ideal for indoor events. Our outdoor venues offer a breath taking view that surrounds our plush lawns, and helipad creating a picturesque backdrop for any event. We also provide hotel accommodation on site to assist with make-up, hair-styling and privacy during the course of the wedding. We also cater to both indoor and outdoor event and customize each venue based on the nature and scale of the event,” says Rohan Seolekar, Director at Oxford Group Pune India. MLR Convention Centres are located in two prime areas in Bangalore, namely JP Nagar and Whitefield that are popular hubs of the city. The venues are designed to suit all your needs and requirements. 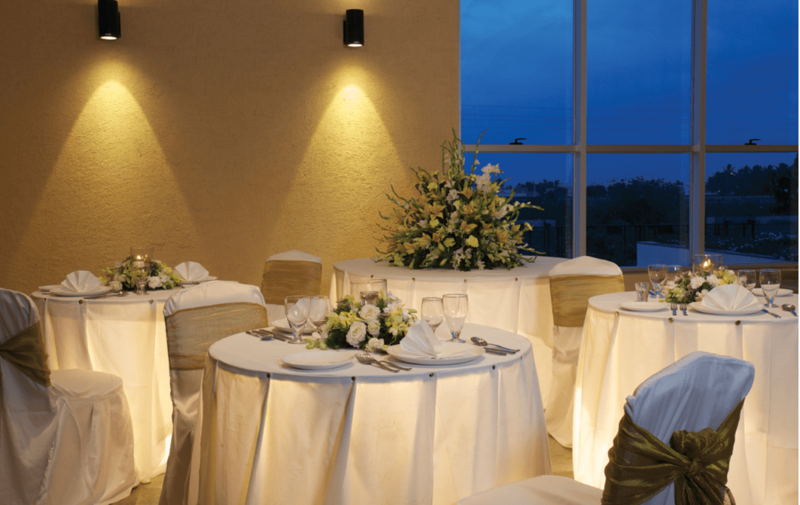 These have free flowing spaces, open courtyards and spacious banquet halls with great parking facilities. “We have well trained staff that understands what needs to be done for a wedding. With 8-10 years of experience in the wedding industry, the MLRs are a sought after wedding destination. These are state of the art venues that are designed to meet international standards. They are well maintained and will definitely have a positive impact on guests. Our team has over 8 to 10 years experience of being in the wedding industry,” says Ramesh Kumar, Senior Operations Manager. Established by Brigade Group, these centres have state-of-the-art facilities with world-class services. Catering Services include buffets, plated meals, cocktail fares, barbeques and banquets. They also have bridal care services through a well-equipped and professional unisex salon with specialists who offer wedding packages for both the bride and groom and also have all kinds of transportation services. The start of a new life post your wedding is a memory to be cherished for a lifetime. Naturally, choosing where you spend your honeymoon is something that must be done with thought. However if you are fretting over what to choose here are some of our top picks as far as the best hotels are concerned to spend your honeymoon. The newest addition to the royal city of Mysore, Grand Mercure Mysuru offers a bouquet of experiences for honeymooning couples to discover and enjoy the magic of a new relationship. A contemporary set up in a culture rich city with an array of cuisine types and services wrapped in French hospitality are some of the elements put together in creating an unforgettable experience for a holiday. The hotel also offers delightful surprises like special couple Spa treatments and exotic dining experiences. “We have a specially designed romantic getaway package for couples who would like to indulge in a rejuvenating holiday, to break free from the mundane work life schedule. Valid until 31th December 2016, this package comprises of a night stay with complimentary breakfast and dinner with a signature couple massage from the Zazen spa at the hotel. While at the hotel, couples can have a romantic swim under the stars at our roof top pool and work out together at our fully equipped health club,” says Sachin Malhotra, General Manager. The city of Mysore is home to iconic palaces, museums, bird sanctuaries, national parks and exotic archaeological sites and you can enjoy the serenity of nature and the royal-world charm and return with a lifetime memory of a scintillating honeymoon experience. A honeymoon in Goa is a perfect way to raise the curtains to a new beginning. Spread across 10 acres of land, Planet Hollywood Resort, Goa is an upscale property with a stunning collection of rooms, each with its own, one of a kind touch of Hollywood memorabilia and richly appointed amenities. With two niche restaurants to satiate your taste buds, you must spend time at The Pink Room Salon & Spa that offers an extensive choice of body and beauty treatments. Charmaine Moraes, Associate Director of Sales says, “a basic package for stay is always on offer and it is also customized with a limousine pick up, room décor with towel art, fresh floral arrangement and rose petals, a Bottle of Vintage Champagne, personalized amenities and linen and hand crafted chocolate and fresh strawberries delivered to the room. The resort is entirely Hollywood themed and our in-house activities consultant can offer various options like tyrolean traverse, aqua zorbing, paddle boat, water sports cycle treks with picnic baskets, barbecues at the beach and a range of exciting alternatives to enhance your honeymoon experience.” A private candle light dinner on the lawns overlooking the beach and a PH’ inspired Romantic Honeymoon Gift Bag is also on offer. With twenty cute cottages and lots of privacy around the hill-side, Aamod at Shoghi in Shimla is a great choice for your honeymoon. Pristine greens and cosy spaces across the resort offer lots of opportunities for couples to spend time with each other. There are a plethora of on-site activities for couples to enjoy and also test their adventurous streak. Long and romantic nature walks along trails by themselves or experts early in the morning and during the day are a great option to bond with each other. “You can choose any spot at the resort and we guarantee you a star-studded feast. Trust our chefs to whip up anything the couple wants, opt for a candle-light dinner and lose yourself in your soul-mates eyes. Our spa and jacuzzi is the epitome of the honeymoon trip due to its location! Unwind, relax and gaze into the cloudy peaks and valleys while you spend precious time with your loved one. In fact we customize the honeymoon package for all our guests. We believe every experience is special and it cannot be measured as same for all. We help all our guests design their honeymoon experience,” says Gaurav Jain, M.D. This is where you will find an experience that is unparallel. Conrad Pune has 310 uber luxurious guest rooms and suites with the latest in-room technology, spacious warm gold marble bathrooms with a bathtub and separate rain showers, three specialty restaurants, a chic bar and a deli, making it an ideal honeymoon destination. A dedicated lifestyle floor with the city’s first outdoor temperature-controlled pool, whirlpool, 24-hour fitness centre, Conrad Spa and a salon makes it the perfect place to rejuvenate. “Post their wedding a couple always want some time for themselves to relax and rejuvenate. We have a range of spa packages especially the Conrad Signature Day Spa package, a very indulgent and luxurious experience to gift a couple on their honeymoon. The Conrad Day Spa, includes specially curated luxury offerings like an Audi pick up an drop service from anywhere in Pune, a day’s stay in a Conrad Deluxe Room inclusive of use if the fitness centre, pool, steam and sauna and a luxury Spa experience at The Conrad Spa for the couple. An expansive Buffet Lunch at Coriander Kitchen – the all-day dining restaurant with multiple live counters serving a range of Indian, Asian and Mediterranean cuisines is also included,” says Amit Midha, General Manager.